Here in Canada, it didn&apos;t seem like spring would EVER come—we even had a freak ice storm a couple of weeks ago, believe it or not—but finally, the sun is shining! My spring skincare routine is anti-aging, anti-acne and sun-protective. Don&apos;t ask me what I&apos;m doing with my hand in this photo... I don&apos;t know! Acne prevention: I always mention this, because it&apos;s something I constantly need to keep in check! In the spring and summer, we&apos;re vulnerable to breakouts not just because of sweat and pollution on our skin. Sun exposure also boosts our metabolism—which creates a greater demand for nutrition. When you&apos;re deficient in vitamin A (the "skin vitamin"), this can lead to acne. Factor in stress and hormonal fluctuations, and it can be challenging to find the right balance! Sun protection: Now that the sun is out, sunscreen is a must to protect your skin from damage. 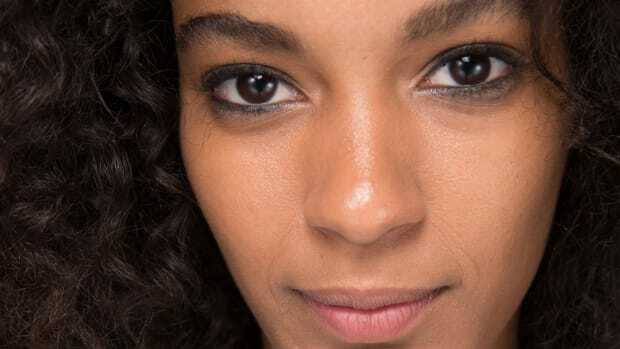 It&apos;s ALSO essential if you have any type of hyperpigmentation, including post-acne marks, that you don&apos;t want to hang around longer. 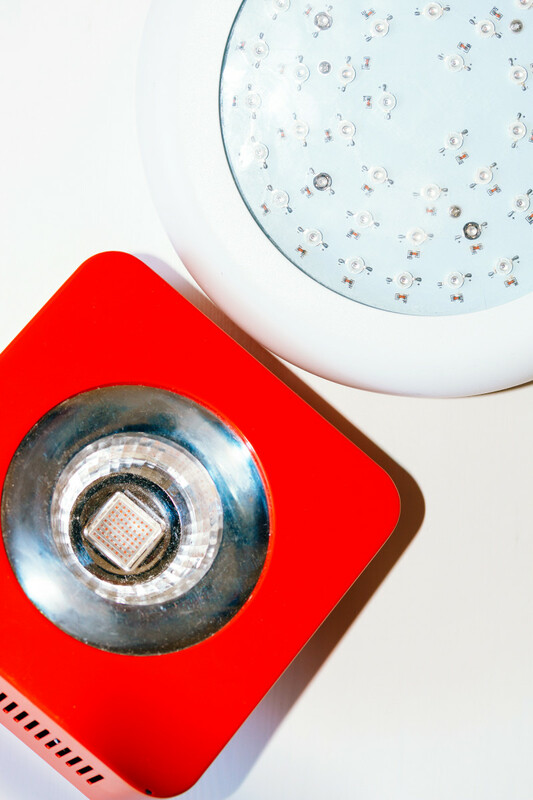 Anti-aging: While I&apos;m continuing to use topicals with anti-aging active ingredients, I&apos;m also on a MAJOR red light therapy kick right now, thanks to this interview. The Baez et al. before and after has given me newfound inspiration to use red light as often as I can! As for how I&apos;ve selected the products in this routine, they&apos;re mostly things I&apos;ve purchased myself, with a few PR samples here and there. For the record, I&apos;m really not motivated by freebies—for me, it&apos;s all about finding the cleanest possible ingredients to achieve the best possible results! If you&apos;d like to know how I evaluate skincare product labels, and what does and doesn&apos;t make the cut, see this tutorial. 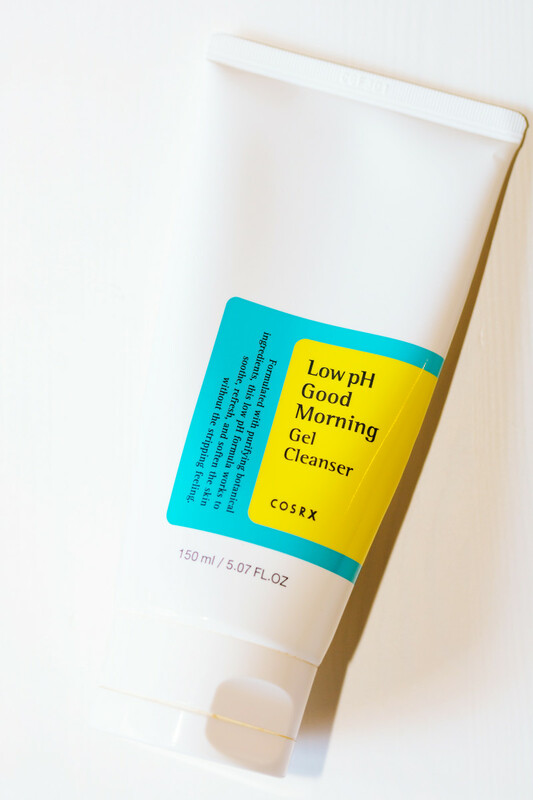 The COSRX Low pH Good Morning Gel Cleanser was new to my routine in the winter, and I&apos;m still using it every morning in the shower. I really like its clear gel texture, which leaves behind no residue. Yet it&apos;s also quite mild, and of course, sulfate-free. If you&apos;re looking for an affordable, non-stripping cleanser, I would recommend it! 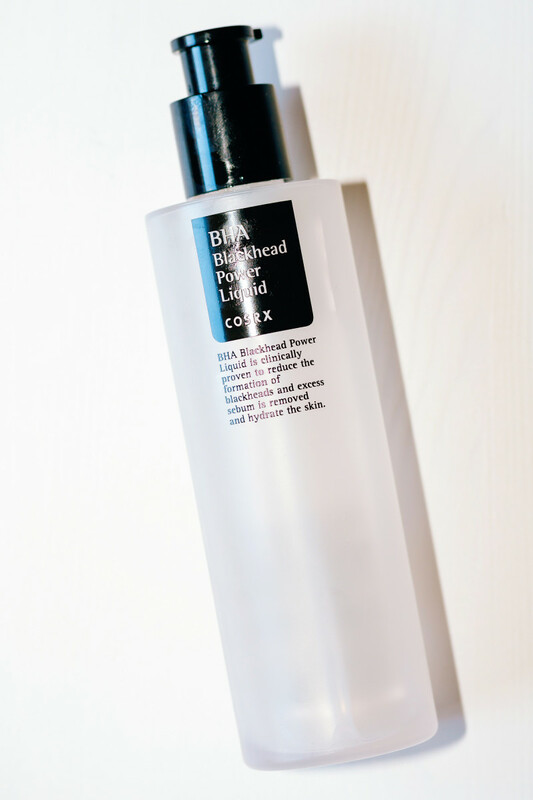 Next, I apply a thin layer of COSRX BHA Blackhead Power Liquid all over my face (avoiding eyes and lips). This is a beta-hydroxy acid treatment that gently exfoliates and deep-cleans the pores to prevent breakouts. During winter, I was alternating between this and the gentler Juice Beauty Blemish Serum to avoid over-drying, but I find can handle the COSRX alone from spring through fall. Note: After I apply the BHA, I wait 20 to 30 minutes before proceeding with the next step. I&apos;m really into niacinamide at the moment! I was rotating between niacinamide and vitamin C in the fall and winter, but I decided to try just using niacinamide daily for a while. It&apos;s not only an antioxidant, but it also helps prevent acne and wrinkles while fading pigmentation and strengthening the skin barrier. 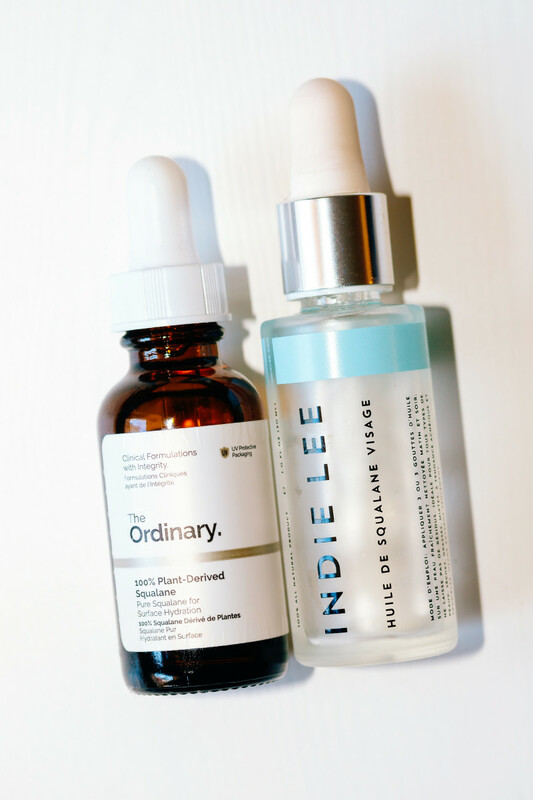 The two in my routine are The Ordinary Niacinamide 10% + Zinc 1% (reviewed here) and Skin Inc. Vitamin B3+ Serum. 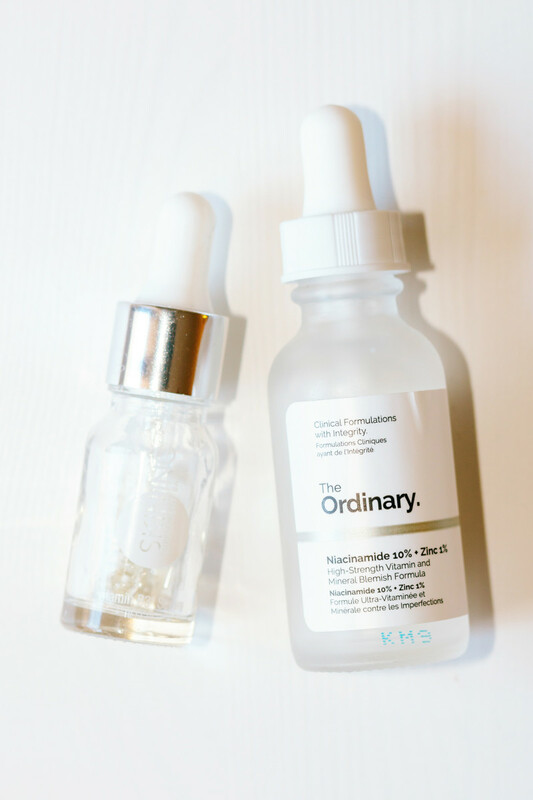 I find Skin Inc.&apos;s has a better texture—The Ordinary&apos;s has a tendency to pill—so I wear it if I&apos;m going somewhere and need my makeup to sit nicely. Once the niacinamide has absorbed, it&apos;s time for my first layer of light hydration. I&apos;m testing a few different things right now, so I will use one of the following depending on how my skin feels. 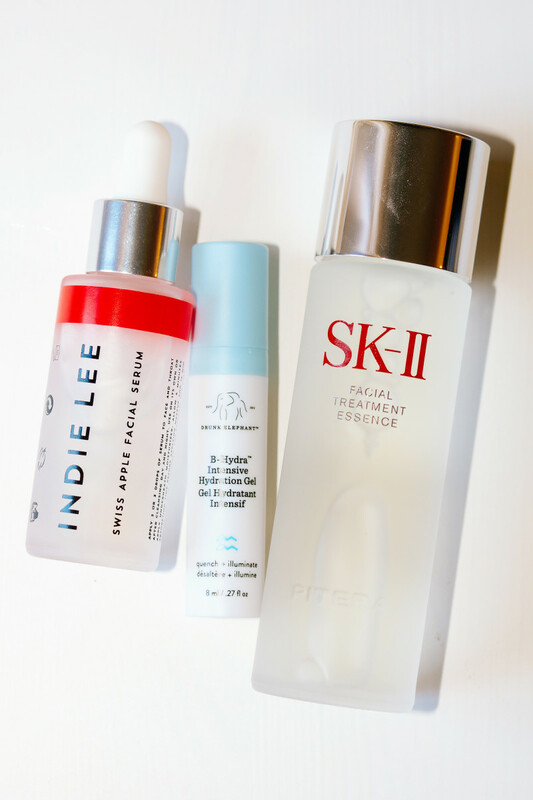 Lately, I&apos;ve been getting lots of questions about the SK-II Facial Treatment Essence, and whether it&apos;s worth the money, so I decided to revisit it (I had it in my routine many years ago). I&apos;m planning a separate post on it, so stay tuned—but for now, I would say it&apos;s a great product for weightless hydration, calming the skin and balancing oil production. As for the much-hyped brightening benefits... I&apos;m not sure yet! I&apos;m also testing Drunk Elephant B-Hydra Intensive Hydration Gel (from the Rise + Glow Duo), and I really like it—I&apos;ll probably buy the larger size the next time it goes on sale. I love how fast it absorbs, and it&apos;s surprisingly moisturizing for the gel texture. The smooth finish is a great base for makeup. Last but not least, I have the Indie Lee Swiss Apple Facial Serum, which contains hyaluronic acid and apple stem cells. 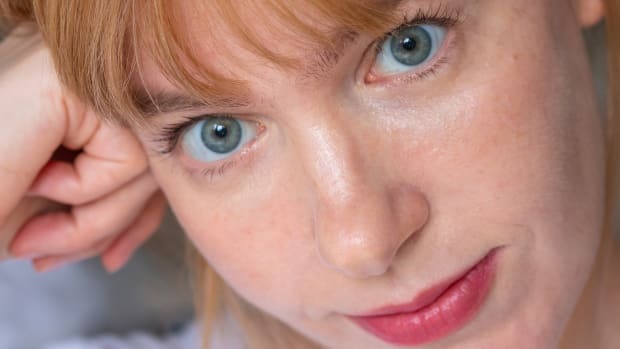 I&apos;m not completely sold on plant stem cells, but this study found they reduced fine lines and wrinkles by about 15 percent after four weeks. I figured it&apos;s worth a shot, right? I love the minimal ingredients of this formula and the light serum texture. I&apos;m such a squalane oil addict, I almost always do a drop or two to seal in my serums and as "eye cream." I also find the oil helps prevent sunscreen from pilling. 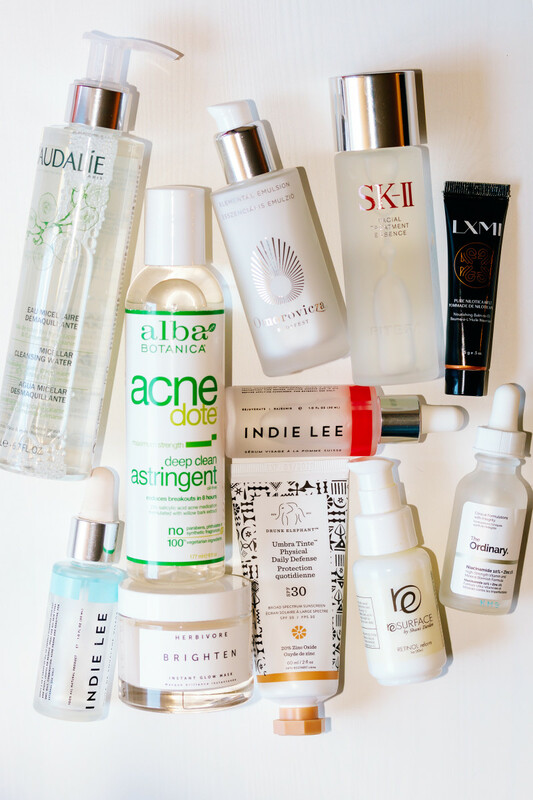 Right now, I&apos;m using Indie Lee Squalane Facial Oil, but all of these are great. 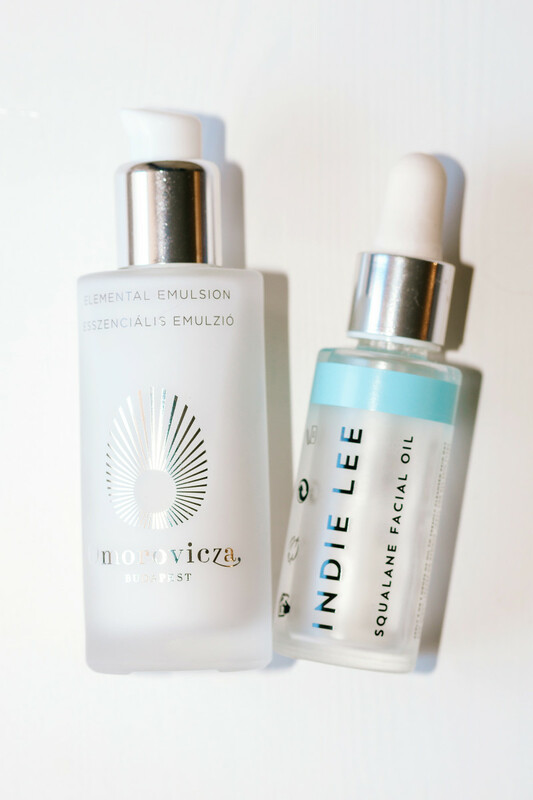 If I&apos;m just staying home and not wearing sunscreen or makeup, I also love Omorovicza Elemental Emulsion (reviewed here). It&apos;s a lightweight, silicone-free lotion and one of the few moisturizers I can recommend! I just bought two high-zinc sunscreens from my 2017 recommendations list that are FINALLY available in Canada (I&apos;m going to try and do a review of both!). 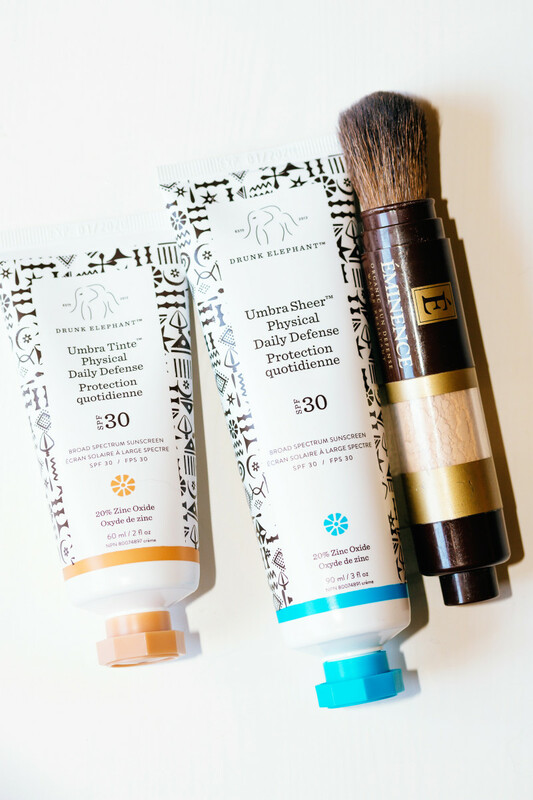 Drunk Elephant Umbra Sheer Physical Daily Defense SPF 30 is the sheer one, in the bigger tube so it&apos;s better value. But if you have trouble with zinc leaving a white cast, I would recommend the Drunk Elephant Umbra Tinte Physical Daily Defense SPF 30, which is tinted. I&apos;ve also tossed my Éminence Sun Defense Minerals SPF 30 (reviewed here) in my handbag so I&apos;m never without sunscreen. It&apos;s a powder that you can easily brush on without messing up your makeup. 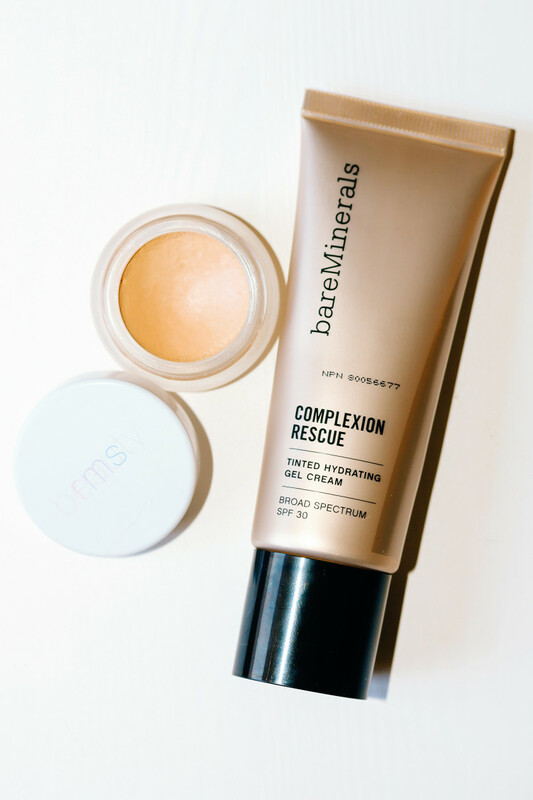 One new thing I am testing in this category is bareMinerals Complexion Rescue Tinted Hydrating Gel Cream, which caught my eye because it&apos;s silicone-free. It&apos;s light coverage, with SPF 30, and the shade range is excellent (I bought it in Birch 1.5). I don&apos;t wear this over the sunscreen or lotion, though, as that would get too dewy for me. Squalane, shea butter and lanolin are the lip balm ingredients that work for me, as I explained here. 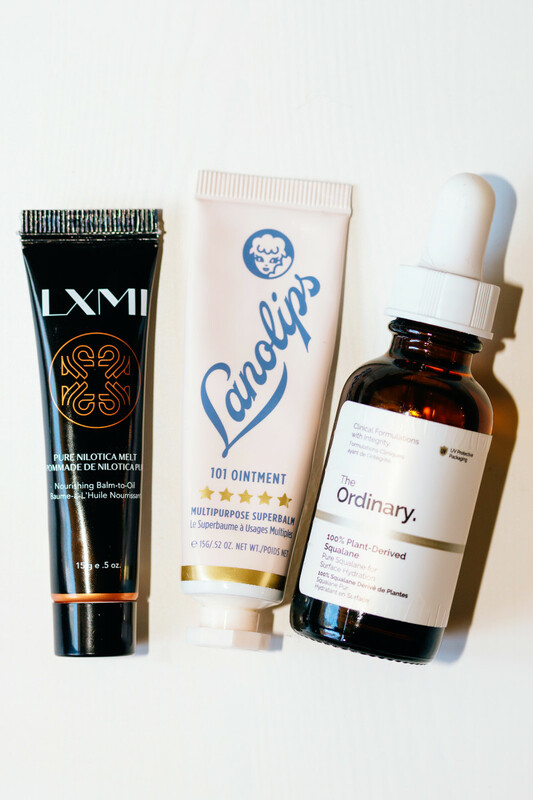 So I rotate between The Ordinary 100% Plant-Derived Squalane, Lanolips 101 Ointment Multipurpose Superbalm and LXMI Pure Nilotica Melt Nourishing Balm-to-Oil (which I just bought in the tube format, perfect for my purse). My evening routine starts with a first pass all over my face with micellar water, to remove makeup. 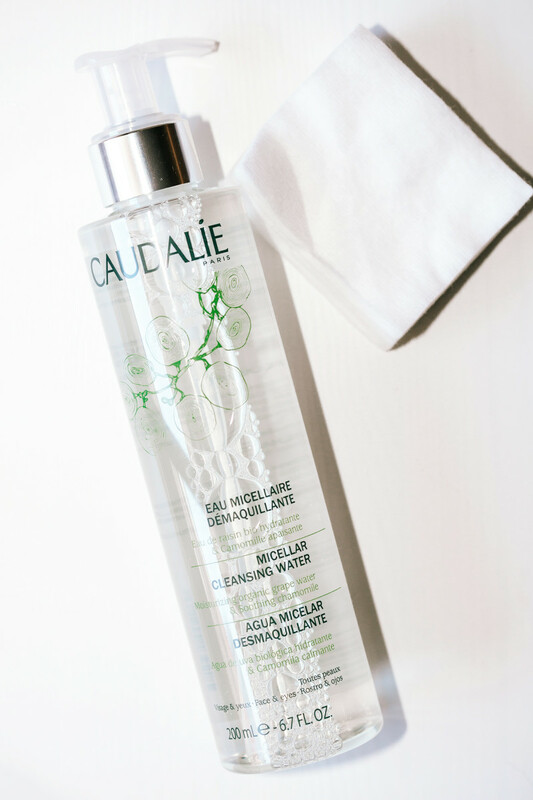 I&apos;ve long been loyal to Bioderma, but I&apos;m testing Caudalie Micellar Cleansing Water and it works just as well, despite being a more natural formula. My cotton pads of choice are Shiseido Facial Cotton. 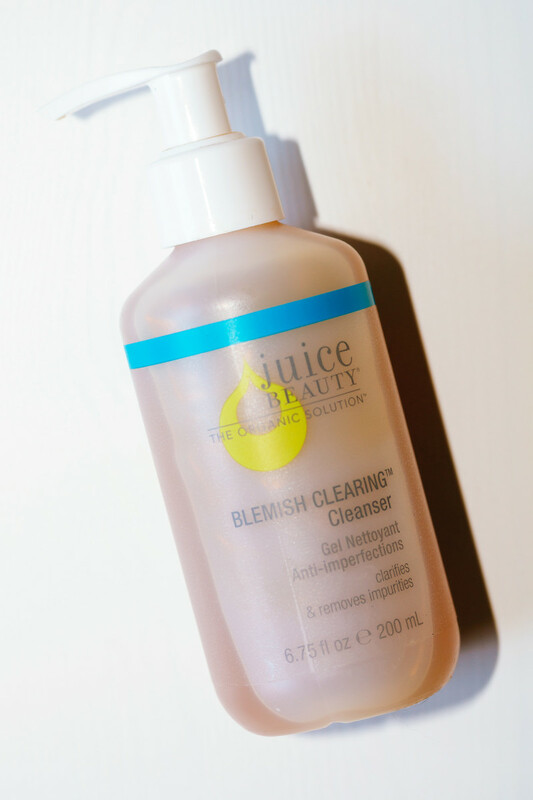 For my second cleanse, I&apos;m still using Juice Beauty Blemish Clearing Cleanser. I just really like this formula! It has a gel texture but isn&apos;t drying, and rinses clean with no residue. You may recall me talking about the oil and cloth cleansing method, which I still love. 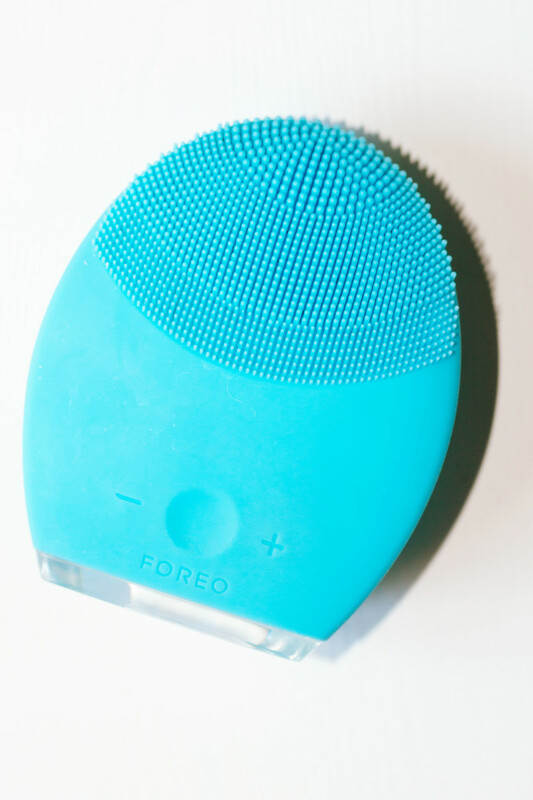 But lately, I&apos;ve just been doing the Foreo Luna 2 instead and it really does give you similar results in terms of deep-cleansing and gentle exfoliation. I use the one for Combination Skin, which I prefer to the Normal Skin one as it has longer bristles (I feel like it gets in the pores more!). Never once has this brush irritated my skin, and it doesn&apos;t get gross like the nylon brushes do, since it&apos;s made of silicone. Note: What I do is spread the Juice Beauty Cleanser onto my damp skin, and then I work my way around my face with the Luna. Then comes my trusty COSRX BHA Blackhead Power Liquid again. I really wanted to try using a toner before it (specifically the new Herbivore Jasmine Green Tea Balancing Toner), but for some reason, that causes a CRAZY ingredient reaction resulting in flushed, red, itchy skin! So just FYI in case you think you can&apos;t tolerate a BHA... it could be you just need to rinse off whatever is underneath it. In other news, you know how annoying it is to get breakouts on your neck, back or chest from sweat in the spring/summer?! 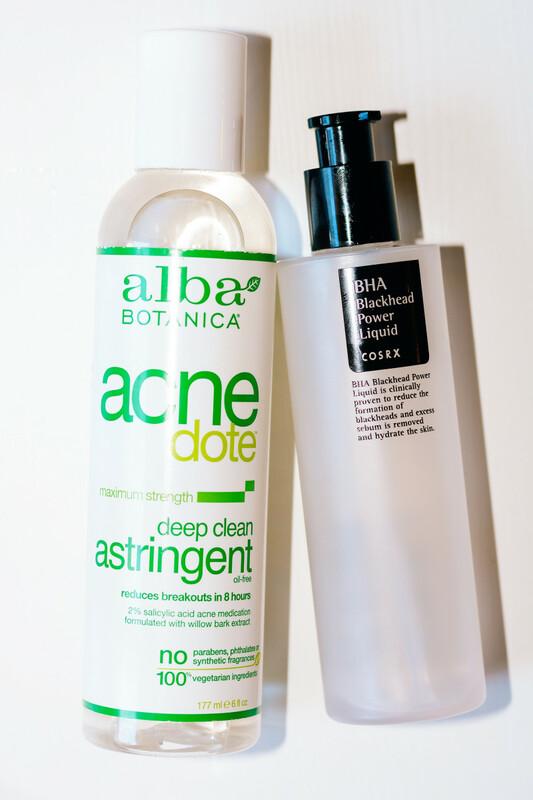 One thing I&apos;ve added to prevent this is the Alba Botanica Acnedote Deep Clean Astringent, which is a 2 percent salicylic acid liquid. There&apos;s actually no reason you couldn&apos;t use it on your face, too—the only caution is that the alcohol will make it a little drying. Note: I also incorporate a wait time here, to allow the BHA to work its magic, before I proceed to the next step. 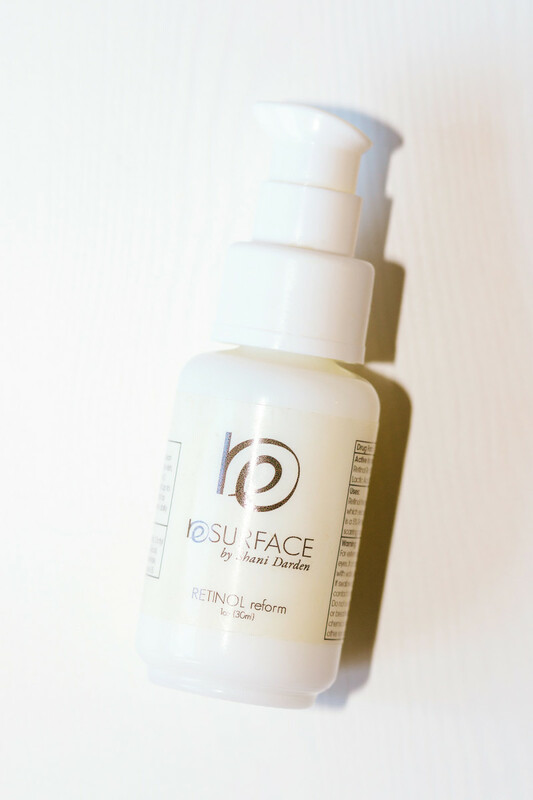 So I&apos;ve gone back to Resurface by Shani Darden Retinol Reform (reviewed here). One, because retinoids don&apos;t stay fresh forever, so I really need to use up the bottle! And two, because I think it does give me slightly better results than The Ordinary&apos;s retinoids. That&apos;s in terms of preventing breakouts, really—it&apos;s the specific type of vitamin A and also the lactic acid that makes it work so well. Because the lactic acid makes you more photosensitive, I plan to finish it before I&apos;m spending lots of time in sun. I would always suggest avoiding AHAs if you&apos;re getting tons of sun exposure. 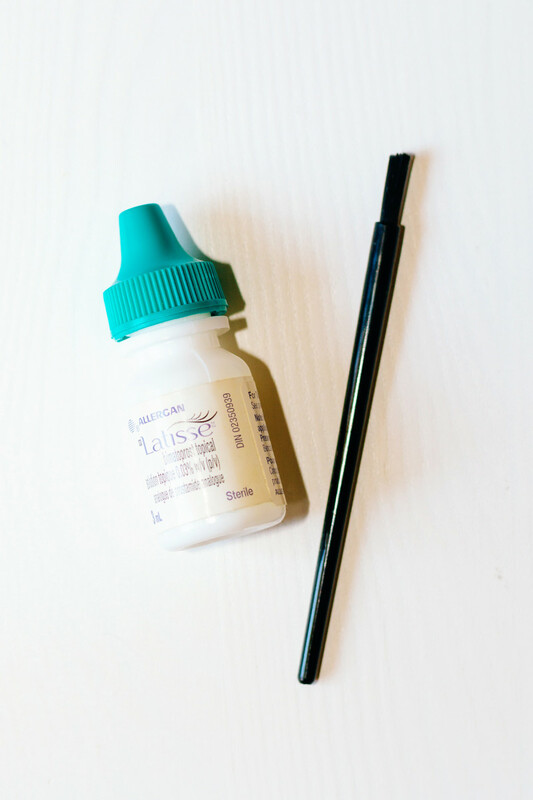 In my winter routine, I was using the Plume Lash & Brow Enhancing Serum... and unfortunately, I didn&apos;t get the results I was hoping for. 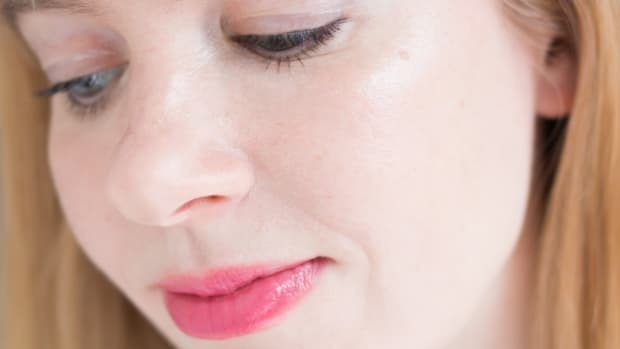 I did see longer lashes the first time I tried it, so I&apos;m almost certain it was because several months had passed before I went back to it—so the tube was no longer fresh. So instead, I&apos;m back to Latisse, which is a prescription product that I&apos;ve used off and on for years. You know what&apos;s crazy? My lashes got noticeably longer after just two weeks! It works and it works FAST. 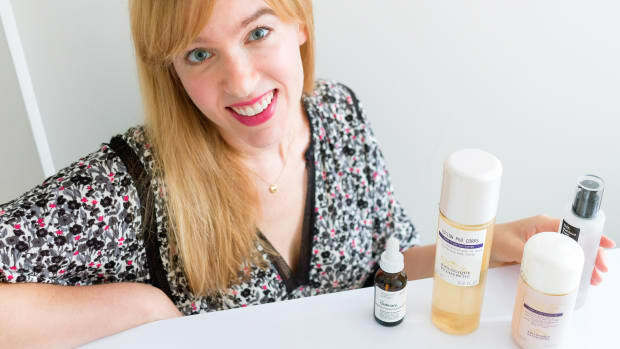 I always apply a tiny smidge of squalane oil to hydrate my lips and under-eyes—right now, either The Ordinary 100% Plant-Derived Squalane or Indie Lee Squalane Facial Oil. If I&apos;m still awake 30 minutes after putting on the Retinol Reform, I may do a final drop or two as my last step. 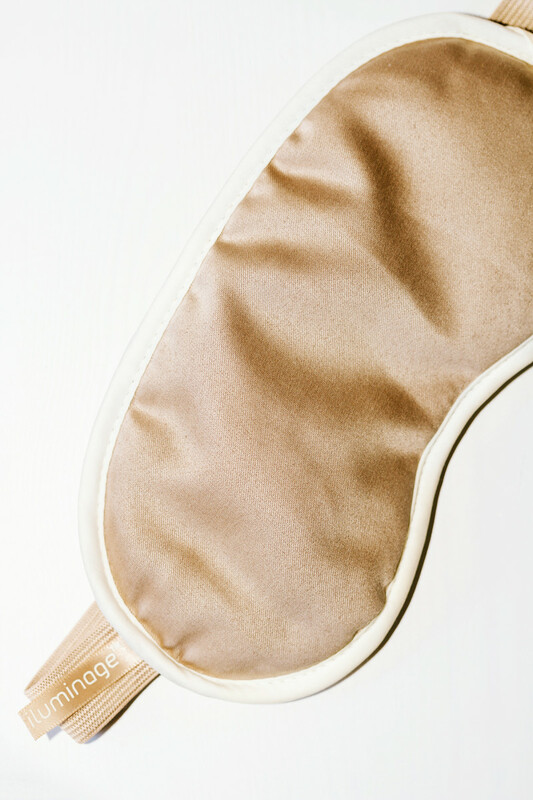 My sleep mask is actually a skincare step, because it&apos;s made with copper fibres that have anti-aging properties. I figure, if I wear the iluminage Skin Rejuvenating Eye Mask (reviewed here) overnight, it makes up for not using an active eye cream! Right now, I&apos;m trying to do a 10- to 20-minute session every day with my Red Light Man Red Light Device, which is anti-aging and anti-acne, among other benefits. I also have the Red Light Man Infrared Light Device, which treats deeper tissue and also delivers skin benefits. It&apos;s just a bit more awkward to use, as I have an older circular model. The new ones are square and stand upright, so I&apos;ll probably invest in one of those soon! 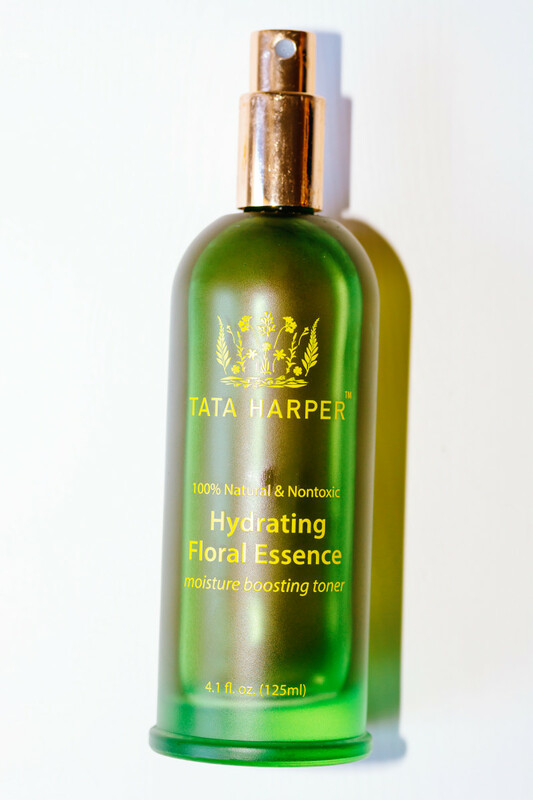 The masks I&apos;m reaching for lately include the Tata Harper Resurfacing Mask (reviewed here) and the Herbivore Brighten Pineapple Enzyme + Gemstone Instant Glow Mask (reviewed here). I find those are good to perk up my skin before a night out. 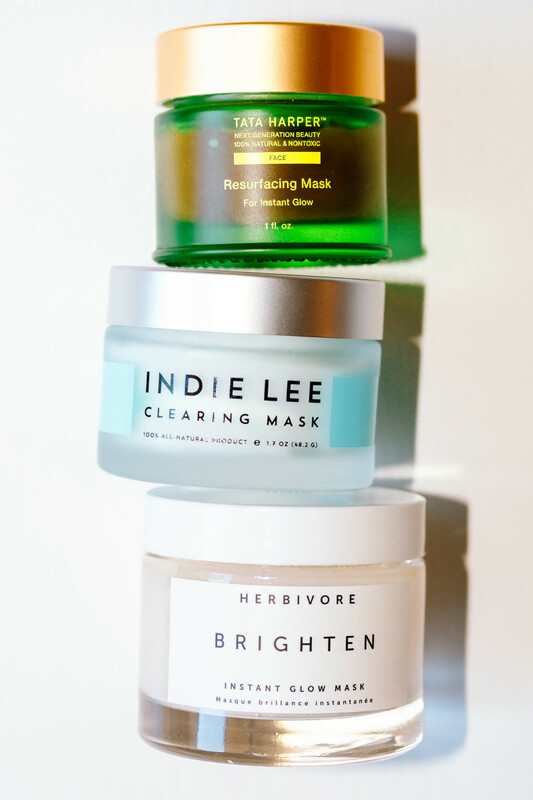 For PMS times, I&apos;m enjoying the Indie Lee Clearing Mask on my T-zone, as it contains bentonite clay, zinc oxide, sulfur and salicylic acid—all amazing for excess oil and/or breakouts! 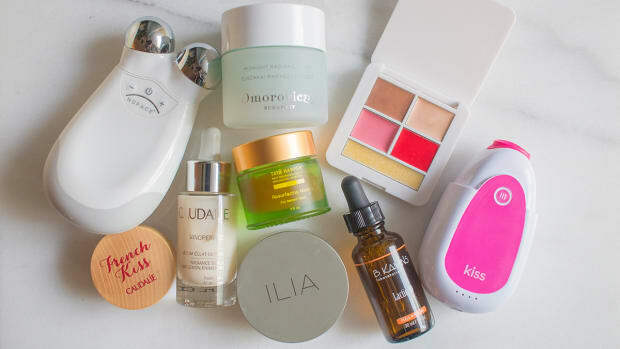 A few of the key products in my spring skincare routine. Now you&apos;re up to date on everything I&apos;m using, testing and loving lately! Although there are a lot of products, keep in mind that I&apos;m not applying every single thing on a daily basis. 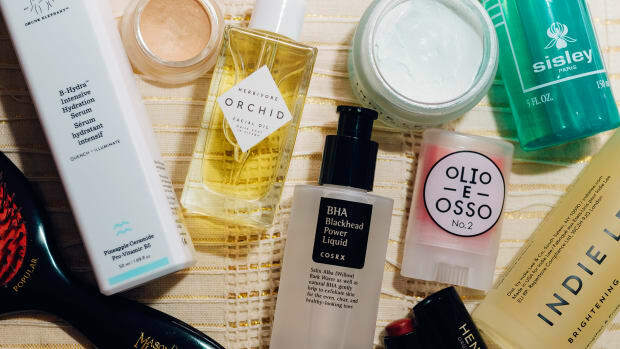 It&apos;s more of a skincare "wardrobe," where I can customize what I layer depending on the state of my skin, how much time I have, and where I&apos;m going. As for the actives, rest assured that nothing here is leaving my skin irritated. The only two I&apos;d consider "strong" are the BHAs and the retinol (which contains an AHA). These are ingredients my skin has built up a tolerance to over many, many months. So I would never suggest you start with both, at this frequency, or your skin may freak out! Everything else—like the niacinamide, plant stem cells and galactomyces ferment filtrate (a.k.a. pitera)—is about calming, weightless hydration. 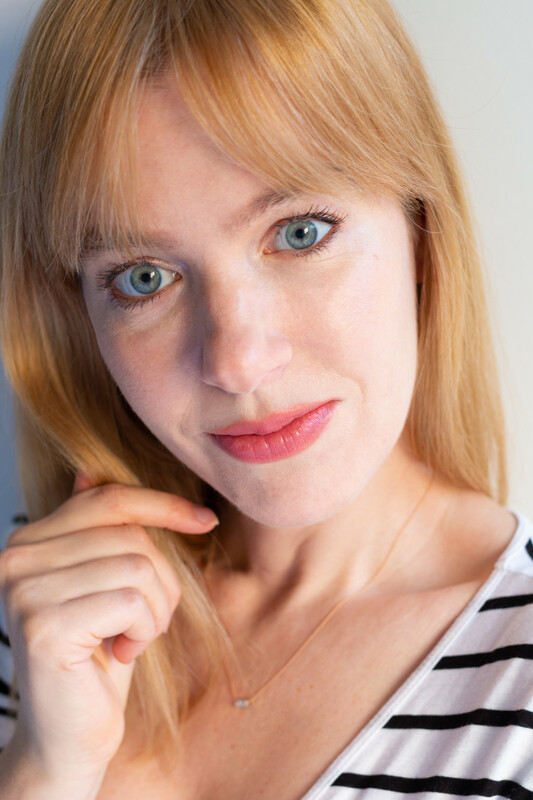 If you&apos;d like to know more about my approach to skincare, make sure to sign up for my FREE skincare course and newsletter (if you haven&apos;t already). I&apos;ll send you my Better Skin in 7 course, which walks you through my essentials for healthy skin. After that, you&apos;ll get regular newsletters with Q&As and product recommendations. Sign up here! What&apos;s your spring skincare routine?